Home > About Allergies > Are Vaccines Safe for Children With Allergies? Vaccines protect children against infectious diseases caused by viruses or bacteria, such as measles, mumps, German measles, meningitis or flu. Vaccines also prevent children spreading the infections to other people, especially pregnant women – infections such as rubella (German measles) can harm the developing baby. Allergies to vaccines are very rare, but they do happen occasionally, and it is important to be aware of them when you have children with allergies, though it shouldn’t always stop a child receiving a vaccine. 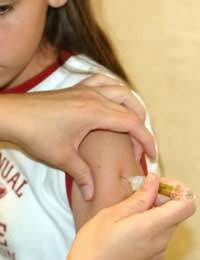 Most flu vaccines are grown in chicken’s eggs, and so people with egg allergies, or parents with egg-allergic children, may be concerned about having an allergic reaction to these types of vaccines. Modern flu vaccines have lower levels of egg protein in them than the older types, so are less allergenic (less likely to produce an allergic reaction). While there are some risks linked with flu vaccination for people with egg allergies, this has to be balanced with the fact that many children with allergies also have asthma. As a bout of flu can make asthma symptoms considerably worse, as well as leading to complications such as chest infections and pneumonia, having a flu vaccination is especially important for these children. Generally, children with mild egg allergies can still receive the flu vaccine, but they should be watched by a doctor or nurse for a few hours after the vaccination, just in case they show an allergic reaction. Doctors can also prescribe antihistamines or corticosteroids to take before the vaccination to prevent or reduce any potential effects. Children with severe egg allergies may also be able to receive egg-based vaccines just as long as they are carefully watched after the vaccination. Some doctors may want to check for reactions beforehand, for example in a skin prick test (when a tiny dose of the vaccine is put just under the skin), or by giving a smaller dose of the vaccine first, before the main dose. Children may also be allergic to other ingredients in vaccines, such as gelatine, which is use to make the vaccine more stable. Some vaccines are grown in a yeast called Saccharomyces cerevisiae, which is also known as baker’s yeast, and is used to make bread. Some people who are allergic to yeast may have problems with these vaccines, but like the egg-based vaccines, it might be possible to give the vaccines safely used under supervision. It is important that doctors know about any allergies that children have, or any reactions that they have had to earlier vaccinations, before going ahead with any new vaccinations. Around one in a million babies and children will have an anaphylactic reaction to a vaccination. This is a dangerous and overwhelming allergic reaction, and the symptoms include itching, rashes and problems with breathing, which may lead to collapse. If this happens, it will be within a few minutes of the vaccination, and the doctor or nurse who has given the vaccination will be trained in how to cope with the symptoms. Even though it is very frightening, most children recover fully from an anaphylactic reaction.